What if this whole thing wasn’t about Chick-fil-A at all? Over the years, corporations have at times been vocal about social issues. It takes courage to take a stand that is sometimes unpopular, but once in a while, a company takes that brave first step. But a couple weeks ago, something shifted. Something happened that caused all anti-gay hell to break loose. Chick-fil-A‘s CEO came out against marriage equality. For years now, individuals and companies have expressed their opinions and those of us in the equality movement have tried to make it known. JCPenney was boycotted by anti-gay groups when they hired Ellen Degeneres as a spokesperson and published a catalog featuring a photo of lesbian moms and their kids. A few people noticed, but it didn’t become a national debate. A list of California’s anti-gay Proposition 8 supporters came out. Some people got hysterical and started small boycotts of some companies, but again – it didn’t really wind up on the news. Then CFA’s CEO Dan Cathy spoke up and told the Baptist Press that the company was “guilty as charged” for backing “the biblical definition of a family.” In a later radio interview, he ratcheted up the rhetoric: “I think we are inviting God’s judgment on our nation when we shake our fist at him and say, ‘We know better than you as to what constitutes a marriage. '” And everyone heard it. I’ve now waded through tens of thousands of comments on Facebook, talked to dozens of people in real life and one thing has become clear. For some reason, something happened that made people stand up and take notice. For many people in our community, we have those in our lives who we know might not be the most supportive of equality. For years we’ve gently nudged them and some have even taken great strides. And then there are some who have just remained quiet while we’ve posted things on Facebook about different stories of discrimination – some violent and horrific. But for some reason, this Chick-fil-A thing happens and EVERYONE has an opinion – and not a small-voiced one either. I made a meme that wound up on George Takei’s Facebook wall. It didn’t mention CFA directly but featured The Muppets’ Kermit and Miss Piggy getting married. 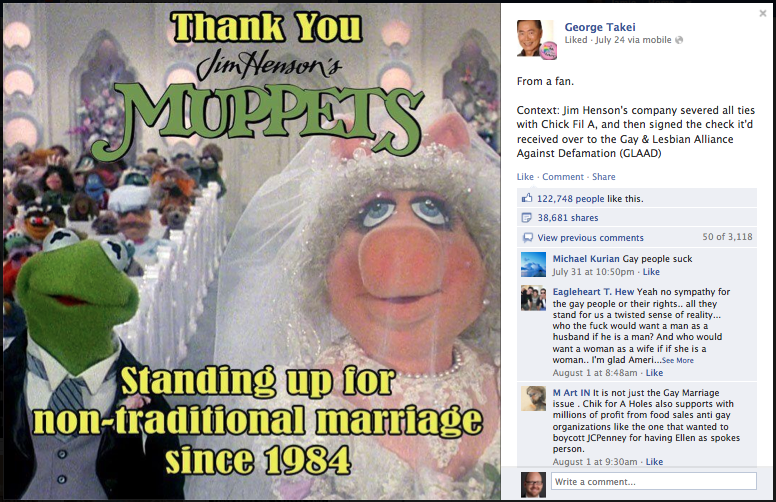 The text read: Thank you Jim Henson’s Muppets, Standing Up for Non-Traditional Marriage since 1984. The meme was shared 38,000 times, liked 121,000 times and had more than 3,000 comments. I’ve found most are from people who are misinformed. 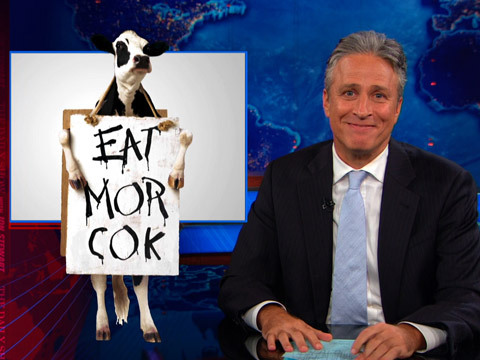 Most who stand with Chick-fil-A think this is an issue of “free speech” trying to be squashed. Clearly they don’t have an understanding that free speech happens in both directions. Anyone can say whatever the hell they want. And when they say that thing, they have to be willing to face the consequences. And then the other side has free speech as well – to do things like arrange boycotts if you like, or educate the public. Many think people are just upset because Dan Cathy expressed his opinion on something and some didn’t like that opinion. Some of us have been working to get the message out there that this is not at all about his opinion on marriage equality, it’s about the millions of CFA dollars he’s spent on anti-gay hate groups. As outlined in an earlier post, he’s given over $5 million to groups that (among many other things) try to cure gay people and fight to have gay people put to death in Uganda. But back to my original question. What is it about this particular moment in history and this particular story that has caused the masses to speak out? I was talking to a friend earlier who is not terribly active in the LGBT community. He’s gay and married, but doesn’t frequently post things even slightly political on Facebook. He’s shocked at how many friends he’s seen with bigoted opinions. Some who even came to his wedding. I too have seen many comments on things whose opinion I never knew until now. Even people like Broadway reality performer Bailey Hanks has taken a side. Normally you would think that someone who spends most of their time surrounded by gay people onstage, offstage, in the audience and more than likely cutting her paychecks, would be supportive. But Bailey posted an image to her personal Facebook page clearly coming out in favor of the bigoted fast food chain. So what is it? Is this really about Chick-fil-A or did we hit a tipping point where those who’ve secretly hated gay people for years feel like their chicken sandwich is worth more than the lives of their gay friends? Just a little update on the status of Bailey Hanks. Shortly after we tweeted the story to her, she replied that she is a “Proud Christian.” I replied and when I looked for a response, I discovered she’d blocked her account. Bailey, if you’re reading this, we just want to know if you believe it is “Christian” for Chick-fil-A to support anti-gay hate groups and if you believe your co-workers deserve the same rights as you do. It’s all we want to know. 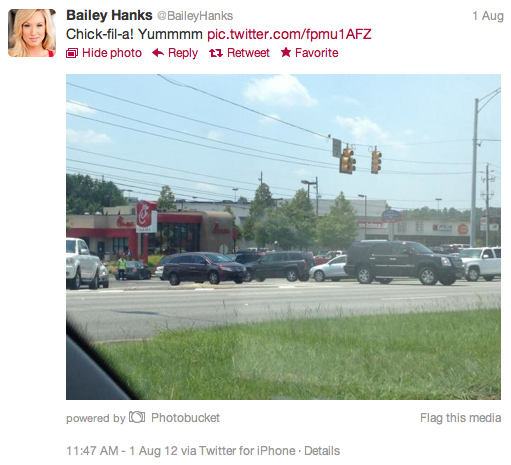 Upon a little further research, Bailey also tweeted her love of the anti-gay fast food chain on Chick-fil-A Appreciation day! I guess it wasn’t just about her “dear friend” who works at CFA. The issue is free speech trying to be squashed. No one is saying the LGBT side doesn’t have a right to express their opinion; however, the government doesn’t have a right to deny ChickFilA its permits because of the owner’s religious beliefs. Yes, it is bigotry. You can spin it any way you like. But when you believe you should have rights that other people don’t have because of who they are, that is anti-gay, hateful, intolerant AND bigotry. Religious beliefs do not excuse you from the label of bigotry. In fact, religious beliefs are usually what incite such bigotry. You are making a conscious choice to discriminate against a group of people who had no control over the fact that they were born different than you. The arguments you use now to defend “traditional marriage” are the same arguments you used 50 years ago to deny interracial couples from marrying. Except then, it was all about how God created different races and put them on different continents and they were never meant to blend. It’s all bigotry, no matter how you slice it. And as for the government denying ChickfilA permits, show me once where that has happened. Show me one time where legally, an elected official stopped CFA from opening a store. Oh, that’s right. No one has. And no one will. While there are many arguments in the gay marriage debate, this one is on the definition of “marriage”. Cathy posits that marriage is defined as being between a man and a woman. A homosexual _by definition_ would be excluded. Under Cathy’s argument, it’s not a matter of rights but of reason. If Cathy, a white male, wanted to be considered a racial minority in the U.S., could he say anyone who refuses to call him a minority is a bigot for their exclusion? If so, then I don’t think being a bigot is unreasonable. It’s perfectly plausible in my mind for Cathy to disagree about whether or not a homosexual couple can be included under the definition of marriage without him expressing hatred or intolerance toward anyone. Regarding your middle paragraph, you know nothing about me. I promise you I wasn’t around 50 years ago to persecute anyone racially, so I don’t know how you can presume to know what my arguments were. Unless you’re saying because you think I’m a Christian I am responsible for every act perpetrated by anyone who has ever called themselves a Christian, in which case you may as well say that modern white Americans are responsible for slavery. This one is NOT on the definition of marriage. If you’d read anything I’d written, you’d see this is primarily about Cathy’s contributions to “Christian” organizations fighting for the execution of gay people. And even if it was solely about marriage, this is not about reason, this is indeed about rights as he is spending millions every year to see my rights as a gay person stripped away. If this was purely about reason, Cathy would have his marriage, I would have mine and we would agree to disagree. But that’s not the case now, is it? He is fighting to stop me from having something he is granted by the government (not the church). Regarding my middle paragraph, you may not have been around 50 years ago, but your arguments were. And I have no doubt in my mind that were you around 50 years ago, you’d be making the same arguments against interracial marriage. Regarding the denial of permits, once again, if you’d actually taken a reading comprehension class outside of Bob Jones University, you’d see that I asked, and to quote: “show me once where that has happened. Show me one time where legally, an elected official stopped CFA from opening a store.” So, did it happen? Has someone been denied a permit? No. For what it’s worth, I sincerely respect your opinion and that you fight for what you believe is right. I just wish you and the rest of the LGBT activist community didn’t act (or at least seem to act) so hatefully and intolerantly toward everyone who doesn’t share your perspective. Even if CFA were the intolerant party, I don’t believe intolerance is a good way to fight intolerance. Which is why I have a lot of respect for the teenage CFA employee who patiently served the man who ridiculed her. And for CFA in general for serving lemonade to the LGBT activists who were protesting them. It’s inspiring to me that they are being hated for their beliefs and that they would combat that hate with compassion. I don’t think I would have that kind of integrity on a good day. Okay, one more time from the top. If this were about a difference of opinion on marriage it would be one thing, but as stated several times before – this is about the millions of dollars chick-fil-a has given to anti-gay hate groups. Yes, these groups have denied their involvement in Uganda’s “kill the gays” bill. Wouldn’t you too? But their leadership has been inextricably linked to hateful legislation. Please, just for a moment put yourself in our shoes. Suppose Burger King decided to start supporting a group called “We Love Everyone, Inc.” What many don’t know is that WLEI is quietly trying to pass laws in Namibia to have Christians put to death. When asked about it, of course they say “We love everybody, we don’t personally agree that some magical guy in the sky impregnated a virgin, but we have the right to our beliefs.” Would you be protesting Burger King because they disagree with your values or would you be protesting Burger King because they are taking the money you spent on french fries and giving it to groups who want to see Christians killed? I’m sorry, but all the lemonade in the world would not make me feel better about what they do with their money. You simply cannot stand there and tell me CFA is a victim here. This statement of yours seems to be a combination of right leaning media, online media, or activist organizations saying what the LGBT activist community does vs what it actually does. Also, you’re not taking into account anger experienced by many LGBT men and women who legitimately feel as though they are reduced to the status of less-than or second class citizens in America. Given this perceived injustice, where LGBT families are not recognized or protected under the law, where LGBT men and women can be fired on the basis of their sexual orientation or gender identity in most of the country, and where LGBT people literally feel unsafe in their homes and neighborhoods, you should give us a little more credit after realizing that most of us are still remaining respectful and calm. Later on you explained that you “can’t fight intolerance with intolerance”. I would point out that in any civil rights movement, you most certainly can. No one should tolerate being treated unfairly or unjustly by the government or other fellow citizens. Remember: those who stand against gay rights have an opinion. Gay men and women fighting for gay rights are fighting to better protect their lives and make this nation more fair, safe, and secure for them and their families. Jamie, like I’ve requested, show me some solid evidence that the organizations to whom CFA donates are committing these atrocities and I’ll be outraged right along with you. Anyway, perhaps the funding of genocidal organizations is your issue, but I honestly don’t think that’s what most people are even aware of in this debate (if it in fact is true). 99% of the comments and articles I’ve read indicate that the LGBT activist community is upset at CFA because of its founder’s personal beliefs about marriage. There has been a little talk about the organizations to whom CFA donates (usually from a huffpost article whose citations don’t pan out), but everything I’ve read (main stream, liberal-leaning media) seems to indicate that those organizations are legitimate. The only things I’ve read to the contrary are LGBT activist organization articles in which they take comments out of context and instruct their audience on how to interpret said comments so as to make the organizations look as bad as possible. That’s not to say it isn’t out there, but that most of the conversation is happening regarding that evidence, not Ugandan genocide propositions. And no, I don’t support the people who made the “thanks for not supporting the fags” comments. I support the individuals (straight or otherwise) who rise above the hatred of others and exemplify Christian principles like forgiveness, patience, and integrity in the face of persecution. Props to any homosexual employees who show this sort of love to those attacking them. Sincerely. I don’t have any evidence to believe CFA or its owners are anything but victims. They’ve certainly been victimized by government officials and the organization itself gives millions of dollars to verifiably legitimate charitable works and they certainly seem to be treating their opposition with considerably more dignity and respect than they’ve been receiving. The only thing against them are uncorroborated claims of supporting homosexual oppression and genocide, and I believe in innocence until guilt is proven. None of these things are made up. They are all supported and true, despite the organizations now denying it. So how will you be expressing your outrage? Please cite credible sources. Props for linking to the original tax document, however. That was helpful and reliable. Sincerely. tax records, direct quotes from organization leaders and statements from the southern poverty law center are all credible sources. If you don’t want to read them on my blog, read them elsewhere. The “biased blogs” you speak of are the ones who do actual research into the wrongdoings of hypocrites. If you want to read lies, watch fox news for a couple hours and listen to them parrot the statements of these organizations as if they had any evidence to back them up. I have been able to explain to every single person I talked ti face to face what the CFA boycott was all about. Each and every one of them apologized for listening to the “It’s about free speech” argument without really checking on the facts and have since stopped supporting CFA. Aside from the truly anti-gay crowd, if you talk to people in person they will most likely understand and realize that they were duped by leaders of a movement simply bent on denying other people family, social, and workplace protections. I’m a gay friendly Christian. While I certainly do not condone the support of bigotry, as a guy often caught in the middle, I have to speak up. I’ve seen a lot of hate spewed back the other way from the LGBT community. I feel we are all flawed humans are there is a major lack of respect on either side on the argument. I do not know if this is the case with you and it very well may not be. I do not think either side wishes bad on the other side in most cases. Yes, there are some who go to the extreme. I guess what I’m trying to say is that by being in the middle as I am I would just like to ask each side to calm down and try to understand each other. Can you understand bigotry? Not really. But I’ve found that if I speak to people with respect and educate them, they may not adopt my belief but they will start to see my point of view. The problem I have with the Chick-Fil-A boycott is that it pointed a lot of fingers and there were a lot of bad things said about Christians in the process. It did not serve anyone well at that point. I’m a peace a love kind of guy. I follow the example of Jesus, he was a bit of a hippie really. I stand by you and wish you the best. Thanks for listening to my babblings. First I would caution you. Hatred and anger are two very different things and it is necessary that one be able to tell the difference. I’ve learned that when people are angry, it is appropriate to ask them to attempt to use appropriate language to describe why they are angry, but not appropriate to tone police them or ask them to calm down. Additionally, LGBT men and women, myself included, often feel a great deal of anger when people reduce our struggle for equal rights and fair social treatment to “an argument” or “an issue” instead of more appropriately pointing out that it is our lives and families that we’re fighting to protect. Being in the middle is a good place to be. It takes something astoundingly horrible to pull me into the extreme, such as Bryan Fischer falling for the establishment of an “underground railroad” to spirit children of gay couples to “traditional home” (kidnap). Funny enough… CFA donated a nice chunk of change to Bryan Fischer’s hate group. I digress. Education is important. This is how the social acceptance side of the gay rights movement is going to be secured. In the meantime, you can’t fault people who feel the sting of social and legal discrimination for feeling or expressing anger. I don’t know you or your name. In fact, I’m not too sure how I came across this blog. However, I do know Ms Hanks and I believe that this entire thing has been blown out of proportion and falseities posted in order to get (your or a groups) point across. I am not too sure of your role. While Ms Hanks claims to be a Christian, I can assure you that I have no doubt she went to that CFA on that given day to get food. She did not go with hatrid or malice in her heart. After reading some of the posts on her FB page, I can not say the same for most if not all of the group attacking her. Of your request to have Ms Hanks read a book of your choice, I believe the group attacking her should go first. I would propose they read a book teaching them how to talk to and address people who don’t believe or have knowledge of their opinions in a respectful manner. Maybe the name calling and hatred would dissipate and people could/would come together in an educated, civilized manner. The attacking side cannot expect people to listen to their beliefs and opinions when being treated as Ms Hanks has been treated. Good day Sir. How is it you can not even be sure how you clicked on a link to find this blog, but you know precisely what was in another human being’s heart? I don’t have hatred for Bailey – not an ounce of it. 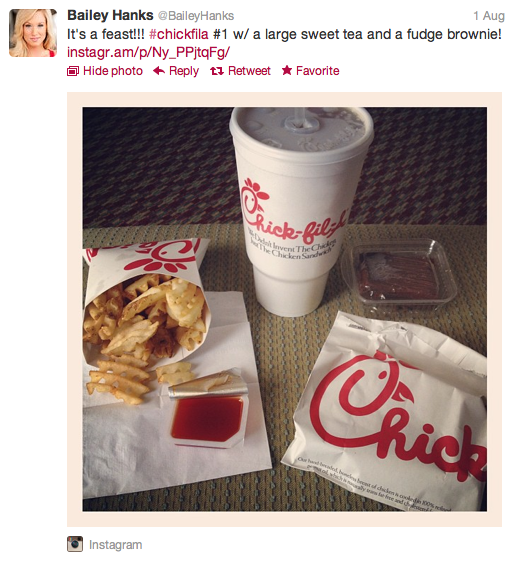 But I am well-aware that she knew precisely that “Chick-fil-A Appreciation Day” is the day she was going to Chick-fil-A to support their anti-marriage equality views. There is no getting around that fact. She talked to a co-worker at length about Dan Cathy and his statements, was aware that he was opposed to marriage equality, got on Facebook and became a member of “Chick-fil-A Appreciation Day’s” Facebook group and then tweeted out photos of her outside Chick-fil-A and then her meal there. She did not go to Chick-fil-A JUST because she wanted to eat. Those are facts. What she did not know (perhaps) is that CFA had given millions to anti-gay hate groups. Groups that not only fight against marriage equality, but spread horrific lies about who I am as a human being – calling me a child molester, saying I am not able to have a relationship, saying that I will be responsible for the destruction of the world. This, she may not have known about. But she absolutely knew that she was standing against marriage equality by going to Chick-fil-A that day – that much is fact. Yes, she has received a great many horrific things typed to her. But I can guarantee the people typing have had far worse to deal with. I’m not excusing their inappropriate responses, but until you’ve spent your entire life being told by society, by churches, by your own family that there is something wrong with you, you simply cannot judge someone who happens to shout a bit on Facebook. When one person’s beliefs trump another person’s civil rights, they have a right to be angry. And we’ve been dealing with that for quite some time now. Bailey is not a victim. I am sorry. I am upset that she has had to deal with some anger and bile being spewed, but sometimes it takes that much to see that the things you’re saying, your family and church are saying are ripping apart our families. I’d be angry too.